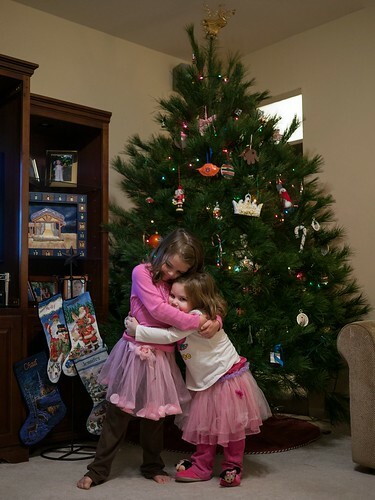 Santa brought the girls a bunch of dress up clothes. 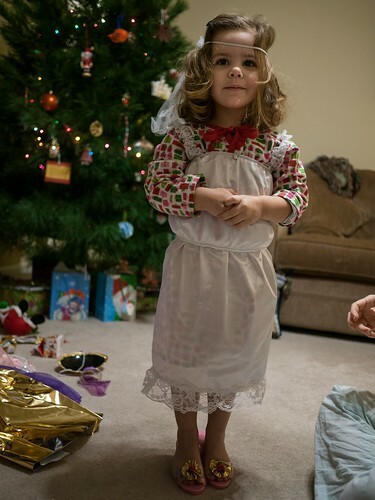 Leah immediately had to put on the wedding attire, including veil and heels, which she wore for the entire time opening presents. Molly was excited to finally get to see Brave thanks to getting it on Blu-ray from her sister. This looks like a big present. The girl's 1st cousin twice removed, Ann, restores very nice dolls and makes clothes for them. 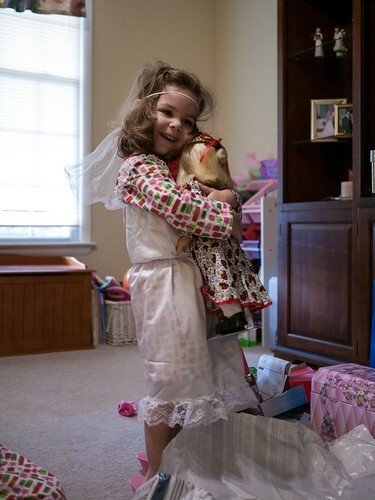 When Molly was younger, she gave her a very nice American Girl doll (also named Molly) which she continues to love. This Christmas, Leah got this very nice Madame Alexander doll, Wendy, along with a few very nice outfits to go along with her. It looks like she'll be a prominent figure in our house for years to come, too. 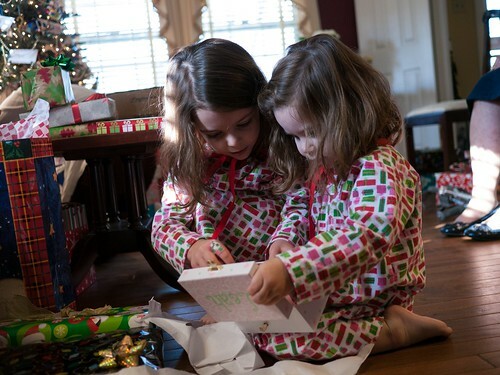 After opening Wendy, I made the girls close their eyes for an unwrapped surprise gift. 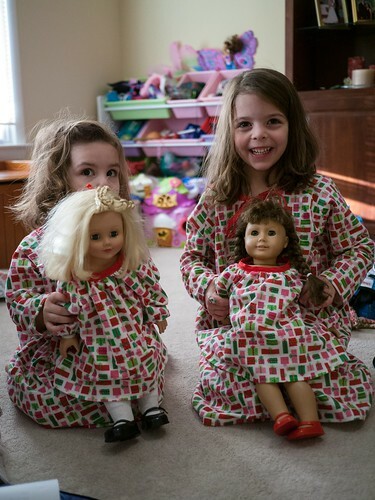 Matching doll nightgowns! 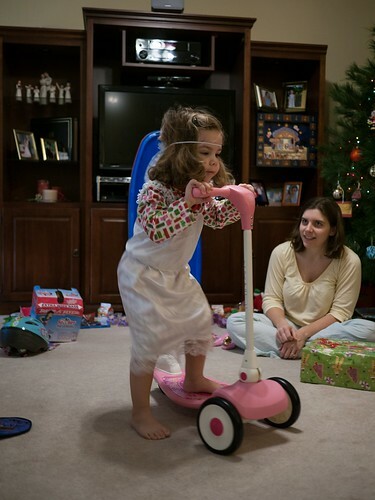 After finishing opening presents at our house, we headed to Grams and Pop's house to open presents there. This music box from Aunt EA was a big hit for Leah, and we've been hearing It's a Small World over and over since she opened it. 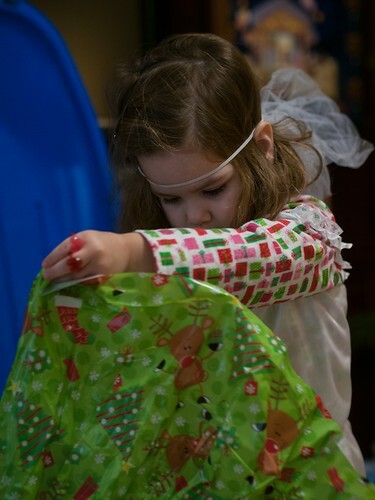 We always open one present at a time, going around the room from youngest to oldest. 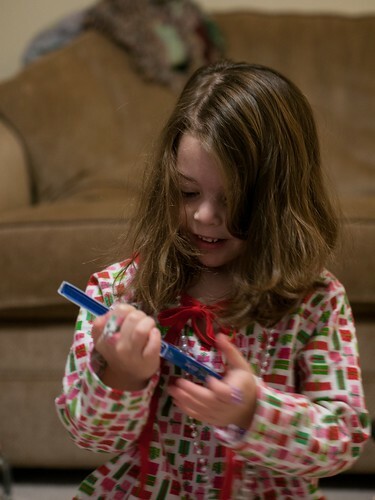 So, Leah spent a lot of time waiting patiently for her turn to open another. 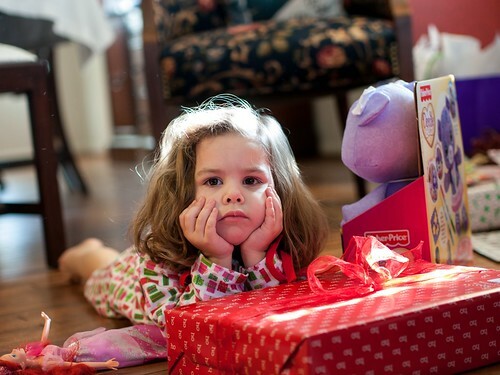 There were lots and lots of dress up clothes this Christmas - for the girls, for their dolls, and even for Molly's bear. 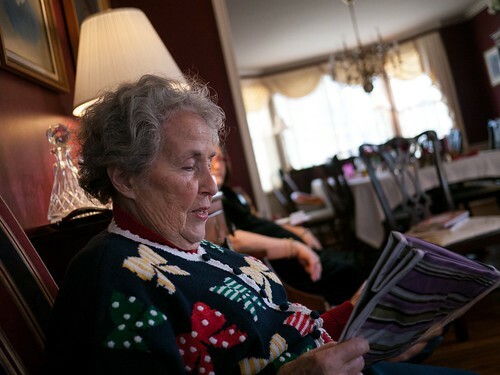 Grammy was in town to partake of the Christmas festivities too. EA's boyfriend, Scott, loves all things bacon. So when I saw this recipe for Candied Bacon Fudge I had to make it for him. It got thumbs up from all who tasted it. Chad even said it was the best chocolate-bacon combo he's had! 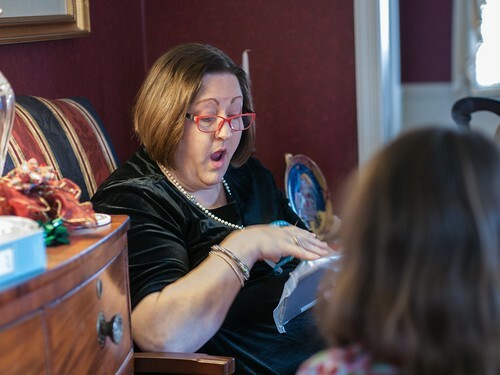 Grams is shocked at the ceramic trivet with custom artwork created by Molly we gave her. 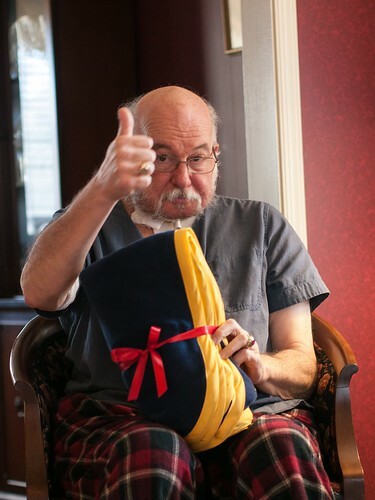 The blanket I made got a thumbs up from Pop. 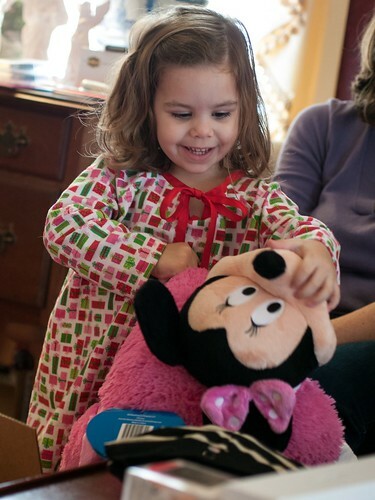 Of course, Minnie Mouse is always a hit. 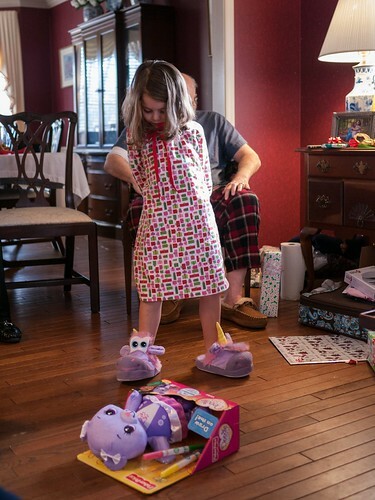 The one gift Molly kept talking about getting were these Unusual Unicorn Stompeez Slippers. When you walk in them, the eyes pop up due to the force of your foot pushing air from the bottom up into the eyes. Nice pearls Aunt EA (given by her boyfriend Scott). 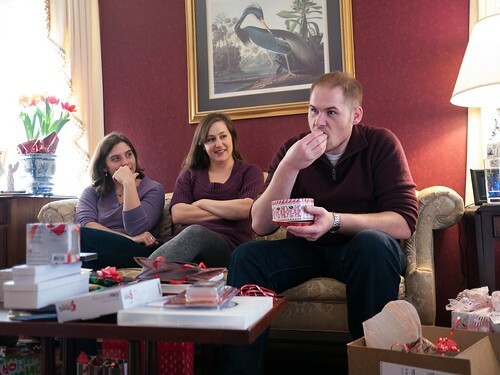 For Pop, EA (with help from several of us) put together a video montage of pictures throughout his life. 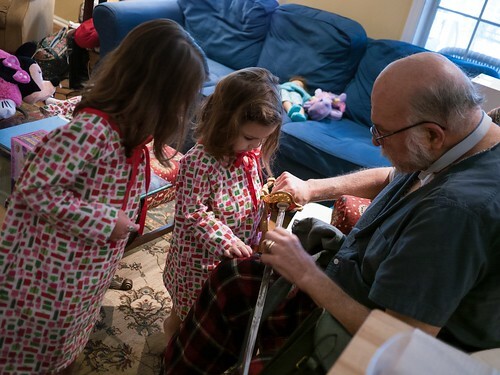 After seeing the video, the girls wanted to see some of Pop's Navy stuff, including his sword. 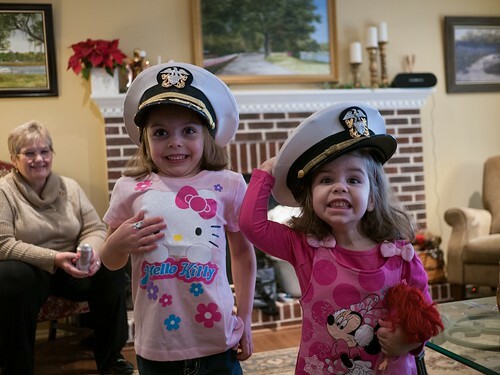 The girls tried on some of Pop's Navy hats. 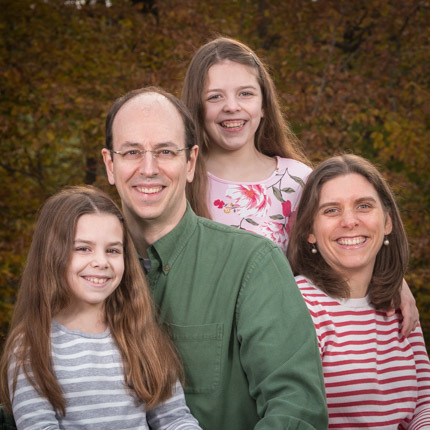 Before Chad took this picture, Aunt Caroline told them to make the biggest smiles they could. She apparently has not learned that you don't tell little kids that, as it will inevitably result in these faces. 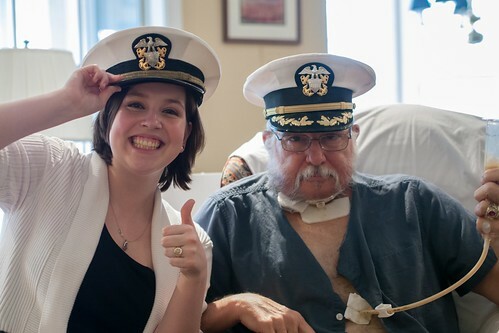 Commander Sellers and Aunt Caroline got in on the hat fun as well. 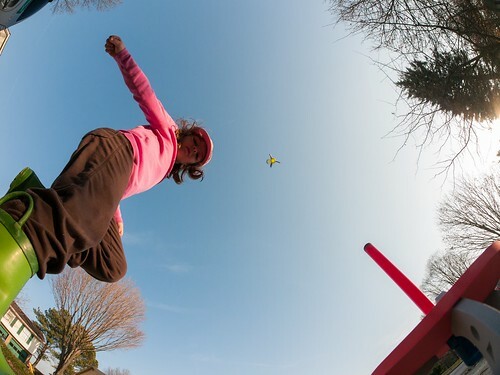 Our Christmas visitors were flying to see us, so the girls decided to make their own plane to go for a flight as well. Of course, there are lots of passengers on the plane. 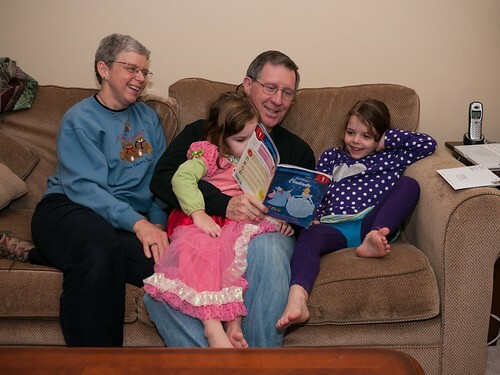 As always, G'Mom and Grampa arrived with lots and lots of new books to read. 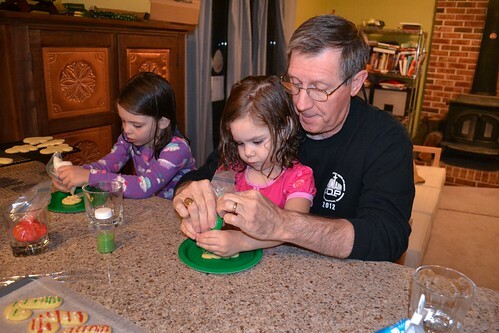 Even though the girls made Christmas cookies with Grams, Molly insisted we make some at home too. 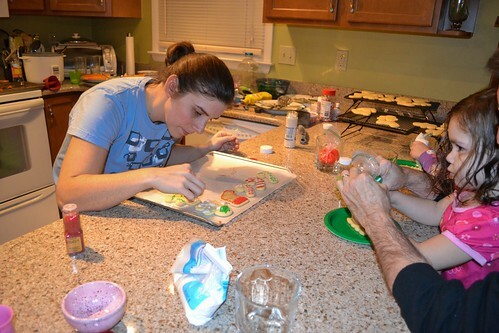 She wanted to decorate them with icing, which she proved to be very good at. I may have had just as much fun decorating! Leah has heard Molly singing Gloria so many times that she knows it now too. 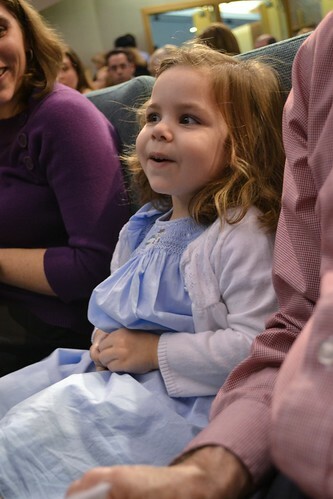 So when the carol was sung at our Christmas Eve service, Leah knew just what to sing. 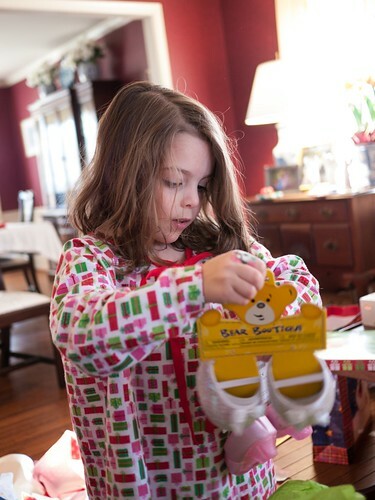 Per tradition, we opened one gift on Christmas Eve. 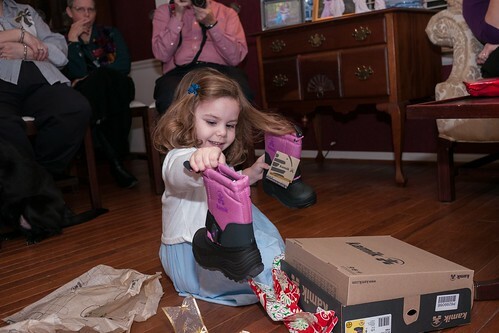 The girls got these fancy snow boots from Grammy, which came in handy since it snowed on Christmas Eve. 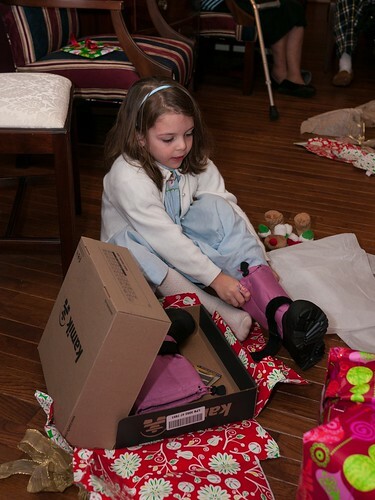 I think the boots go very well with Molly's smocked dress. 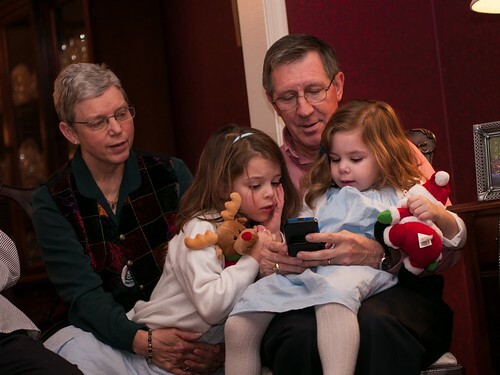 The girls had fun tracking Santa as he circled the globe on G'Mom's iPhone. 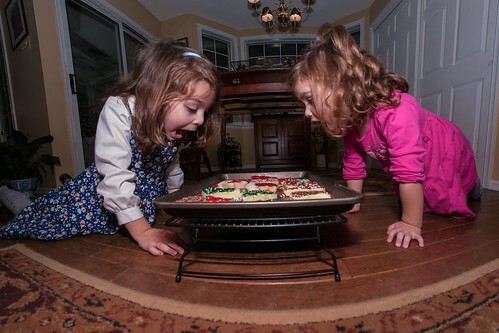 The girls were excited to pick out the perfect cookies for Santa and carrots for the reindeer. 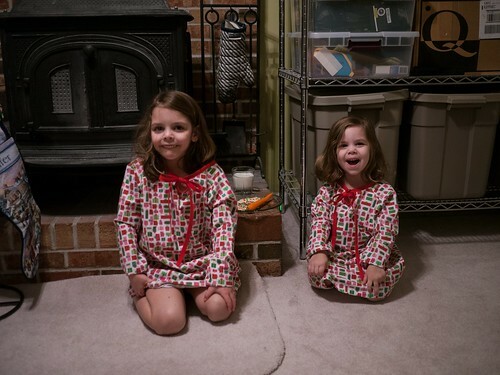 They were also thrilled to finally wear the Christmas nightgowns I made for them. 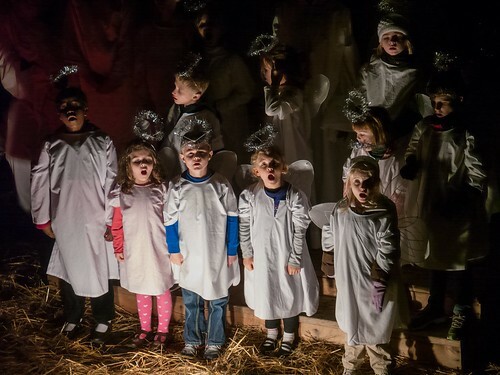 Editor's note: The title of this post was inspired by the song Christmas Is Coming on Laurie Berkner's new Christmas album. We are huge fans of Laurie Berkner and her new album does not disappoint! 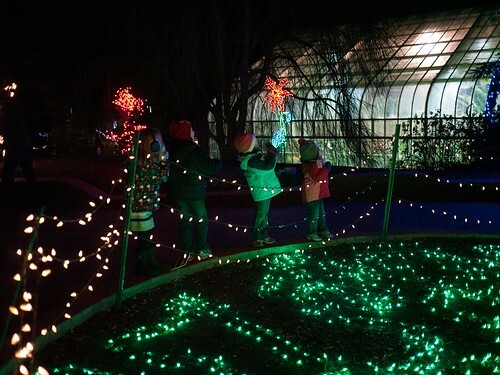 As a child, my family always drove through the lights at Celebration in the Oaks in New Orleans City Park. I have since always compared Christmas light displays to those memories. 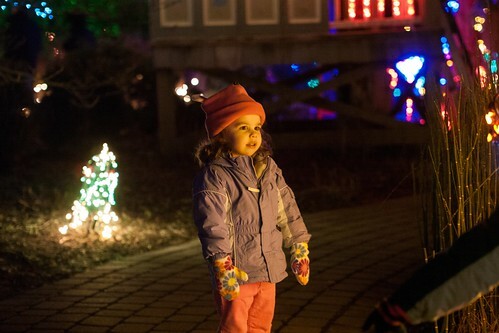 (I know, it might be a tad skewed since I was so little and the lights were so big, but whatev!) 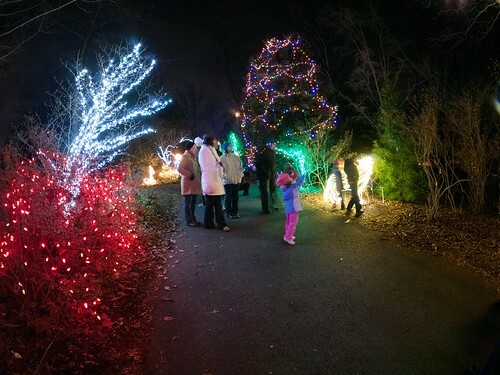 So, when my parents asked about going to see some lights, I knew just where to take them. 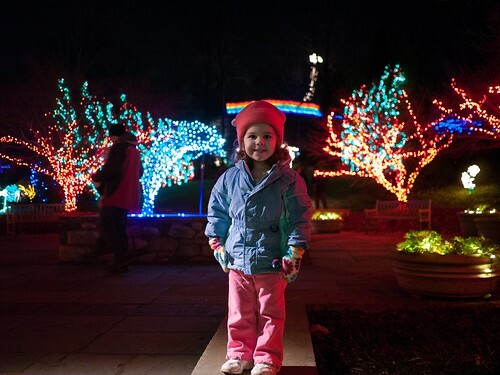 The night of the 23rd we headed to Brookside Gardens with some of our friends to see the trains and The Garden of Lights. 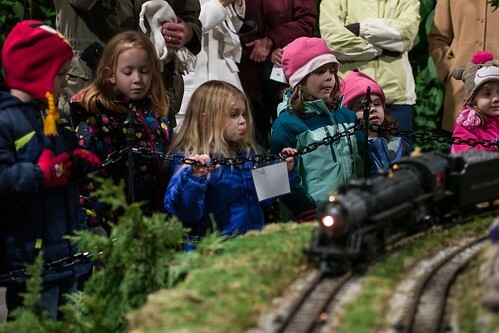 Here are the six kids lined up to look at the trains before heading out into the cold to see the lights. These are the same gardens we took pictures at a couple years ago. Molly and Leah had fun in this house then, too. This is the same rail as this picture. She's a bit bigger now. 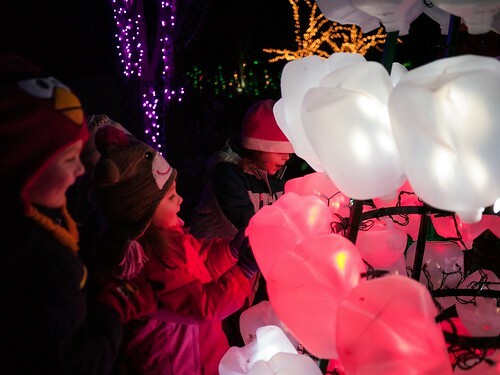 They had an impressive number of lights and some really cool light sculptures. 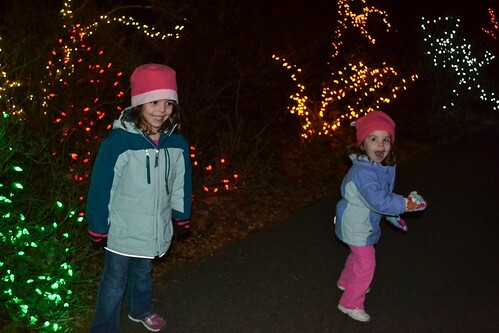 The girls had a great time running through all the lights. Leah, the Ghost of Christmas Pretty Soon. The kids all thought this tree of milk cartons was pretty neat. 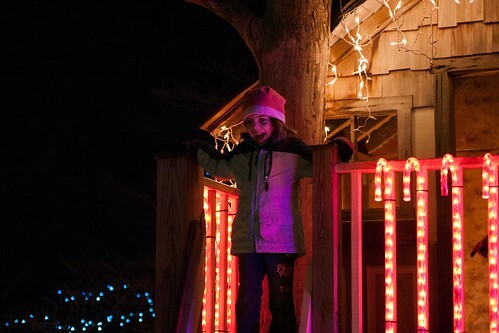 By the end of the evening, our toes and hands were frozen, but there were still smiley, happy kids! 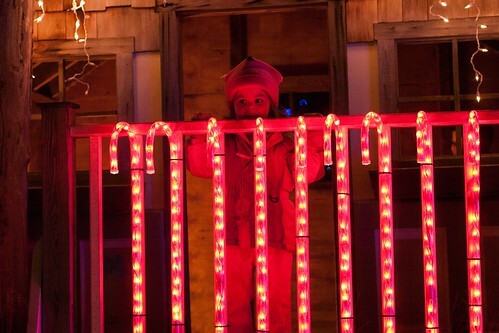 I would venture to say that this was the best lights display I'd been to. 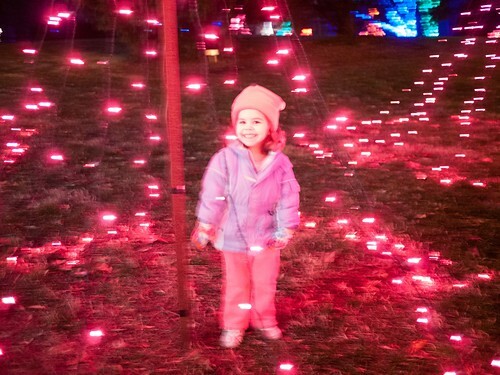 Walking through the lights was a unique way to experience them. So, if any locals have not made the trip down, here's my recommendation to do so! We ended the night with a great dinner at Squisito. (Thank to EMK for the recommendation.) 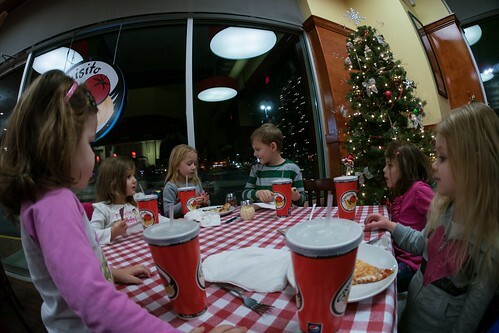 The kids had their own table, which was fantastic for everyone! 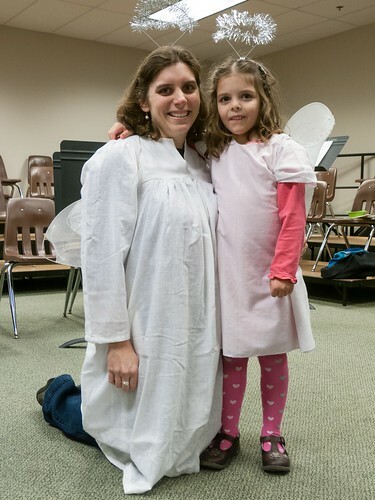 I was not planning to dress and sing, but when Molly asked, I couldn't say no. 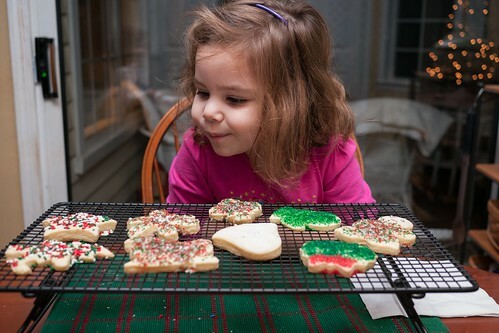 It's become a tradition for the girls to go over to Grams and Pop's house and bake Christmas cookies with Grams, Aunt EA, and Aunt Caroline. When Chad and I arrived to pick them up, we found Leah surveying their product. I think Molly has her eye on one. 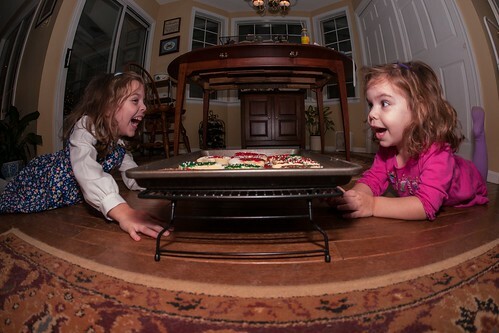 Yes, they get pretty excited about cookies. Saturday afternoon turned out to be quite nice, so Molly took advantage and spent it outside. 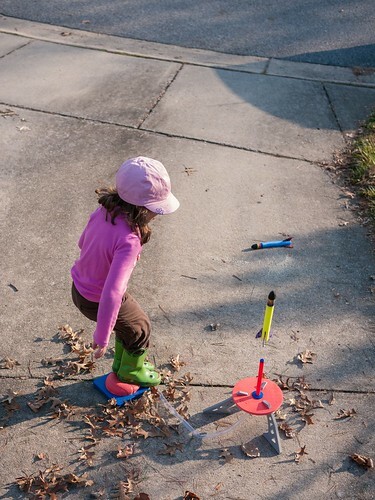 She spent most of the time playing with the stomp rocket. 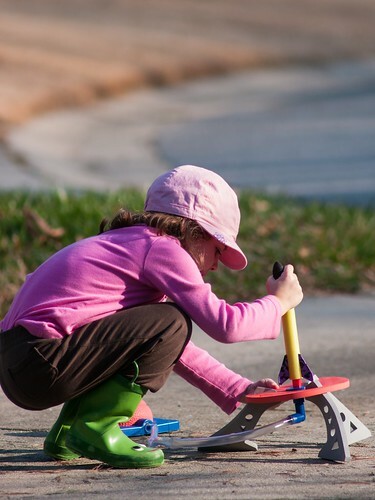 The yellow rocket is about ready for launch. Next stop, outer space! OK, maybe not. What goes up must come down. 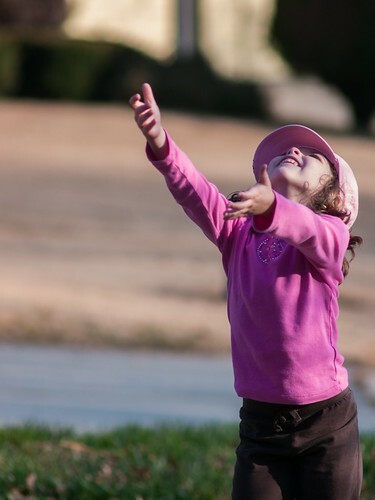 Think she can catch it? Catching with your hands is too easy. 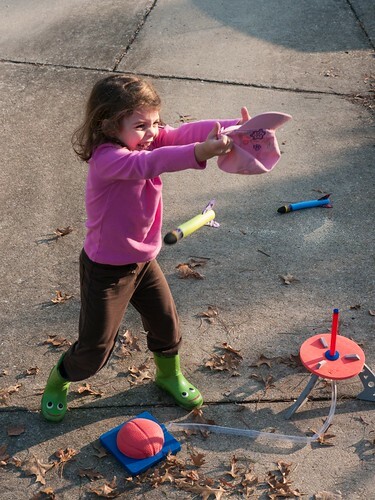 Catching with your hat is much more challenging. 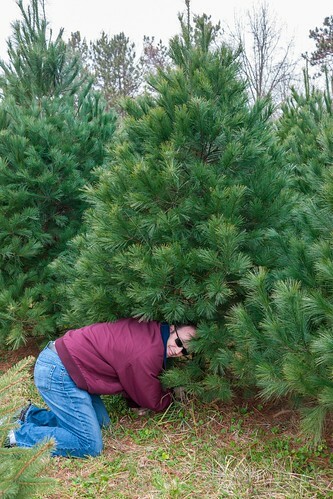 I’m dreaming of a white…pine? 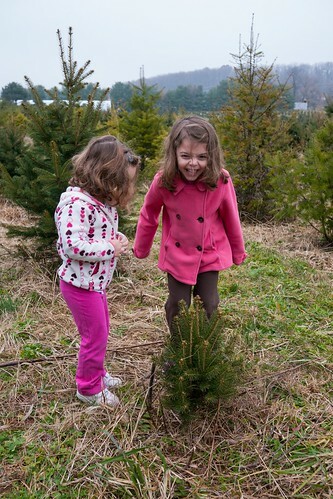 We again returned to Greenway Farm to cut down our Christmas tree. 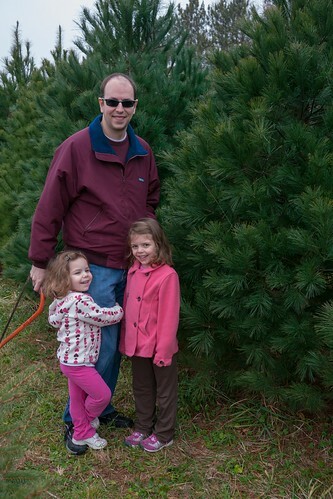 We took a family vote and opted to try out a white pine this year. Molly thought this little tree was the cutest! She kept saying, "Mom, it's so little!" Chad picked out a good saw this year and cut the tree down in no time. That evening, it was time to decorate our new tree. Molly put on the first ornament. 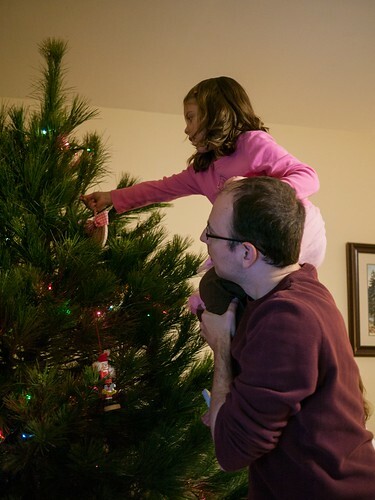 The daddy ladder is sometimes required to reach the higher parts of the tree. 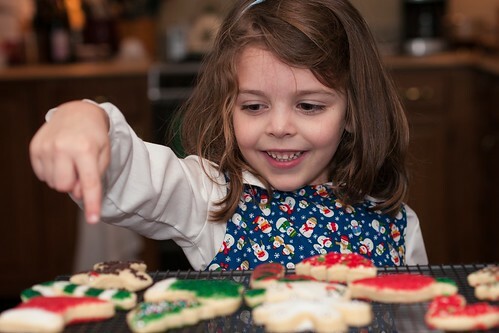 Leah was much more into putting ornaments on the tree this year than in years past. All decorated and ready for Christmas. 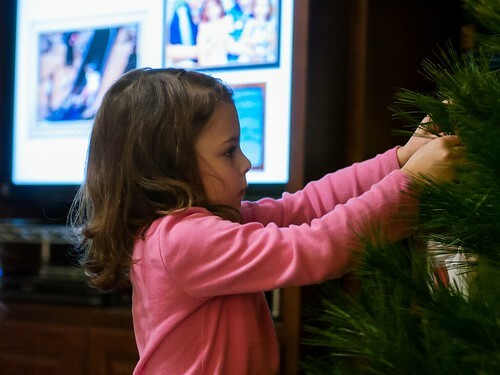 This is the earliest we've ever put up our tree, thanks to our very eager Kindergartener. 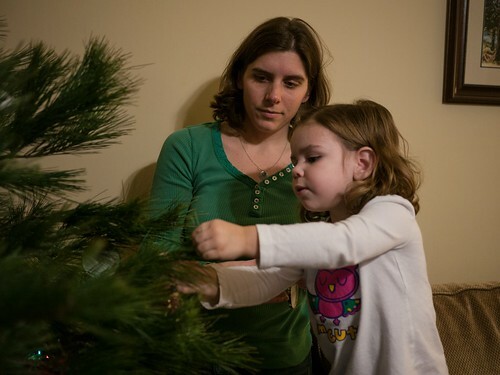 We're hoping that we don't have a Charlie Brown tree come Christmas Day! We spent Thanksgiving day at Chad's parents' with all the family. Leah sported her new dress for the occasion. 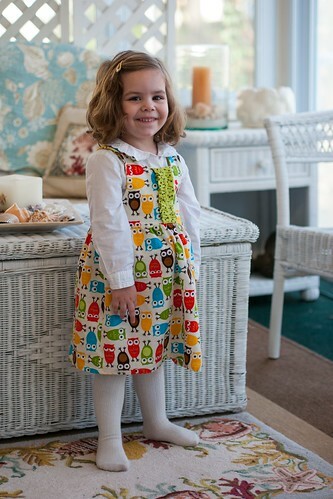 After I completed the first Fall outfits for the girls, I decided Leah needed a new Fall dress too. She's looking very trendy and oh so cute! 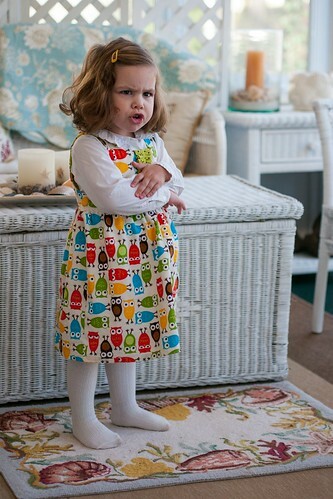 Leah is a very opinionated 3-year-old and can show a huge range of emotion in a short time. 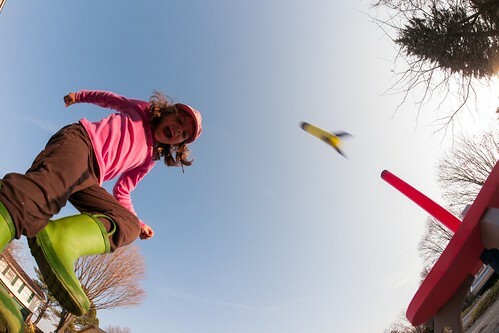 This was 4 seconds after the previous shot. 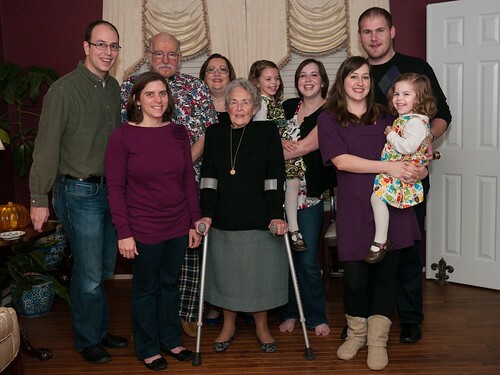 A shot of the whole Sellers clan (plus one who has not yet gone through the initiation ceremony). 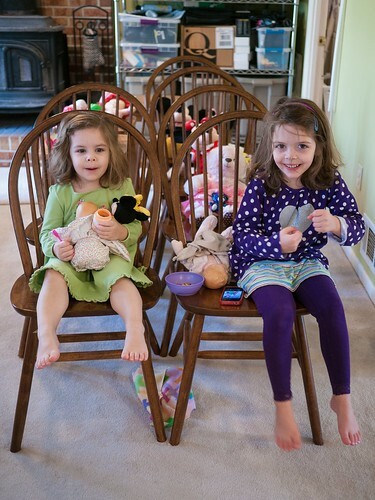 Molly made finger puppets at school, so for our after lunch entertainment, she and Aunt Caroline put on a show for us.